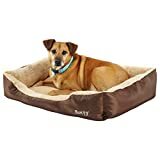 If you want to buy a cheap dog bed you should first remember that your dog's comfort and health is of utmost important. You can, however, save money by choosing a cheap dog bed and here are our tips to save you a few doggy pounds along the way! You'll obviously pay too much for a dog bed that's too big for your dog. For this reason, if you want to save money buying a dog bed, then ensure it's the right size first. Have a read of the dimensions of the bed and work out if it's a suitable size for your dog. Quite often, you get what you pay for, and this will probably be the case with a dog bed. Your dog's health and happiness are much more important that saving a few pounds here and there. To check that the dog bed is good quality, just do some basic research. 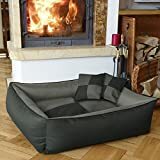 If you are buying a cheap dog bed online, then have a look at the reviews or rating that other people have submitted. This will give you a good idea as to how popular that particular dog bed is amongst other dog owners. 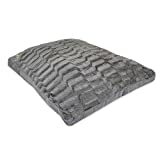 Find out what sort of materials the bed is made from and what material is used inside for the padding. You'll soon get a feel for what sounds good quality and what doesn't. If you buy a cheap dog bed that doesn't last long, it may well end up costing you much more when you need to replace it. When shopping around for a cheap dog bed, it's a good idea to speak to others first. If you are in a pet shop, as a member of staff what's popular and what will be the most comfy bed for your dog. 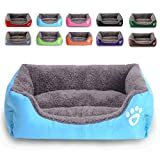 You could even ask your friends how much they spent on a dog bed and whether they would recommend it or not.